What can I say? I’ll just start typing and see how far I get. I’m downloading Lost at the moment and don’t feel like playing poker tonight. I haven’t blogged in a while. I planned to blog at least every week, but things are very tough at the moment. When I was thinking about blogging or not back in December, I was doing very good at the tables and was looking forward to a great year of poker where SNE would be my ultimate goal. As things stand today, I’m at my all time low and it just isn’t fun to write a blog about how bad things are going. I don’t mind to blog about the bad stuff that happens along the road but so far, except the first week, I only have negative stuff to blog about. I just don’t want this blog to turn into one big moan, so that’s for sure not what I’m going to do. I’m not going to blog session by session as I’m normally doing, it would take me to much time and it would only be a lot of bitching. I’ll first show my February results and I’ll go from there. 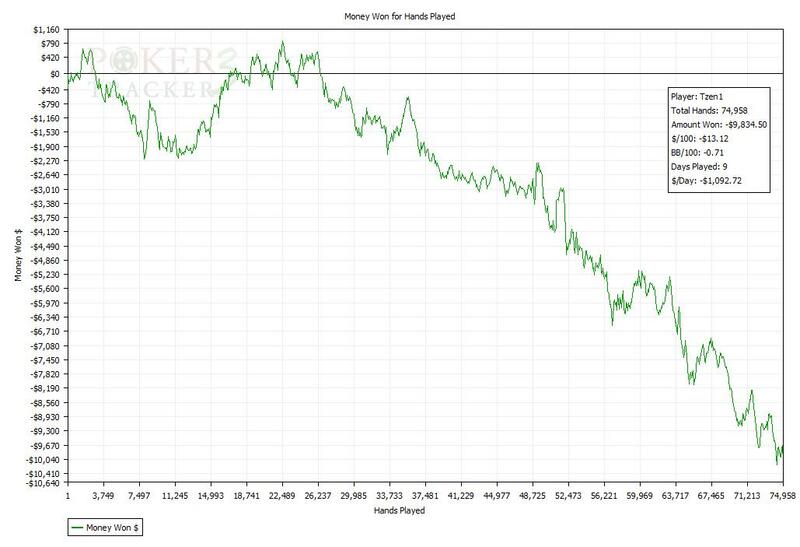 So far I’ve played 74.958 hands and lost $9.834.50 running at -0.71 BB/100. That makes this month even worse then January and at the end of January I thought I had the worst part behind me. From a solid winner in 2008/2009 playing over 1.000.000 hands, I turned into a big loser in 2010, after playing 240.000 hands. Being a small loser would be bad, but I think I could life with that, losing -0.64 BB/100 isn’t small anymore, I turned into a train wreck. It hurts, it actually hurts a lot but if I feel pitty for myself I doubt anyone will let me win. I’ll have to turn this myself and there is only one way to turn it and that is to become better in playing poker. I’m actually not in a bad mood at all and this is mainly because of the time I spent in the gym. I work-out 3 times a week and I cycle 2 times a week and I feel great. I just cycled 2 hours in the gym and I feel very healthy and can’t wait to cycle the Amstel Gold Race in exactly 2 months. I doubt I would still be motivated to play without me being this fit, I really think it’s currently the thing that keeps me going. I’ve also passed the 200.000 mark, that means 20% of the SNE chase is done. That feels like a good accomplishment as well! I’m way ahead of pace, so if needed I could take it slow. Currently I’m planning to finish this month doing the same I’ve always done (Including last year), which is playing 20-24 tables $15/$30 till $3/$6. If things remain as bad as they are I’m going to drop down to $3/$6 the 1st of March and grind my way back limit by limit. This means that I’ll play up to 20 tables of $3/$6, I fill it up till 20 if needed with $5/$10 tables. I then will move up as soon as I proved myself to be a solid winner at that stake. The next level will be $5/$10 filled up to 20 with $3/$6 tables until I’m back where I am now. Last weekend I’ve played a session with my best mate, who also plays LHE on PokerStars. He plays the same stakes so he knows exactly how the game works. He plays a completely opposite style of what I do which makes it hard to try and copy things from each other. What does help is to talk about the game and to understand what his thought processes are when he plays hands in a certain way. This makes it easier for me to understand some of my opponents, as I sometimes really don’t get how solid winners can even win playing hands in some ways. I played a session were he was watching me and it really was useful for me to adjust my play in some spots. Other positive things are the fact that I’m actual winning money against most of the regulars. If I take a look at the top20 people I played most hands with this year I’m a winner against 12 of them. I’m also up in money against the top20 which means I’m not doing bad against the FR LHE regulars. It does make explaining my losses even harder. When I look at the tables I often see a table full of bad players and maybe 1/2 good people. I see bad plays, bad players and I see no reason at all why I should leave the table, but I don’t turn out to be a winner at the end. It seems I lose money against the “average joe”, so that’s where I should probably focus to improve my game. I’m also a big fan of the Olympics, watching almost any sport. I didn’t miss a single speed skate race and I really loved the Snowboarding which aired yesterday. I already thought it was a really good addition to the Olympics 4 years ago but I think this year a lot more people watched it and I only heard positive comments about how cool it looked on TV! I can’t wait to see the rest of the Olympics and I really have to find out where I can watch the Ice Hockey matches because that is the only thing I’ve missed so far. Go Dutchies! If I blog a bit less you will have to excuse me. If I drop down in limits I have to play even more hours to reach my goals. Also as said at the beginning of this post, It’s not fun to only write down negative things. I need to keep my spirit up and it helps me more to watch a TV-Series when things go bad then to spent two hours blogging about how bad things actually are. Go Tzen, keep your head up and grind your way back! What limits are you losing at? Maybe you should focus entirely on the limits you currently are beating. VPPs will come playing 2/4 to 3/6. Sounds like your confidence and poker enthusiam has diminished and a good winning week or two should boost your confidence. Thank god for the cash bonuses and VPP milestones..
Regroup and get focused. Good Luck!!! Any tips? Maybe Because Ive played so many hand I got stuck with some very bad habbits? Ive already stated earlier that I didnt think that I am a very good poker player. But Ive played over 1.000.000 hands in 2008/2009 and was a winner at all limits from $2/$4 till $15/$30 so I believe I have the skills to at least beat the rake. will you ever quit SNE chase and poker if you have another month like Feb?